This weekend Brown, Harvard, and Yale each took athletes to the University of Virginia Challenge in Charlottesville. Heps runners certainly rose to the challenge, holding their own against many of the nation’s best performers this season. There was 1 event victory at the meet, many new nationally-ranked performances, and even some new Heps all-time marks. In the 100m dash, Danielle Barbian (Harvard) finished 7th in 11.85. Shannon McDonnell (Yale) ran a new outdoor PR in the 800m run to place 9th overall. Her time of 2:07.67 is the new Heps leader and is 31st in the region. In the 1500m run, Sarah Gillespie (Harvard) ran a new PR of 4:21.04. She placed 17th overall in a field of collegiates and professionals, and she now ranks 2nd in Heps, and 25th in the region. Emily Waligurski (Yale) had a breakthrough race in the same event and placed 30th with 4:25.47, a PR by 9 seconds. This moves her to 5th in Heps. In the 5k, Harvard had some strong performances. Molly Renfer (Harvard) and Whitney Thornburg (Harvard) finished 12th and 13th with new PR’s. From what I can tell, this was the first 5k on the track for Renfer, whose 16:25.83 is 4th in Heps. Thornburg ranks 6th with her time of 16:27.18, a career PR of just over 7 seconds. Turning to the hurdles, Jackie Modesett (Harvard) clocked a 13.76 en route to 8th place in the 100m hurdles. Although this is not her best time of the season, it is her fastest wind-legal time and ties her for 3rd on the Heps all-time list. Rachel Van Metre (Brown) placed 20th overall with a PR of 14.35, which moves her up to 5th in Heps. In the 400m hurdles, Jade Miller (Harvard) had an outstanding race, placing 2nd overall and clocking a new season best of 57.64 to lead the conference. She’s 8th in the region and 13th in the nation. Teammate Modesett placed 9th, finally breaking the 1-minute barrier to run a new PR of 59.87. She now ranks 4th in Heps and 31st in the region. The steeplechase produced a whole bunch of new season bests. Leading the group was Kira Garry (Yale). She finished 4th in 10:11.59, a new lifetime PR by almost 6 seconds. This moves her into 2nd in the conference, 9th in the region, and 13th in the nation. It also ranks 8th on the Heps all-time list. Next was Brown freshman Natalie Schudrowitz in 5th in 10:18.18, another season best, 3rd in the conference, 21st in the region, and 31st in the nation. Lucy Van Kleunen followed, running 10:24.11 for 8th place, a season best which is 4th in the conference, 29th regionally, and 45th nationally. Rounding out the group was Paige Kouba (Harvard), finishing 9th in 10:28.61 in her first steeple race of the season. It’s also a career PR by over 5 seconds. In the relays, Harvard put together a pair of season-best performances. In the 4x100m, the team of Ashley Collinsworth, Miller, Christi Scott, and Barbian moved the baton around the track in 45.85, 6th overall and the 2nd-best Heps time this season. Harvard’s 4x400m quartet of Miller, Madison Hansen, Modesett, and Gabrielle Scott placed 9th in 3:42.67, also 2nd in Heps. The field events saw some action too. The high jump didn’t produce any new season bests, but Morayo Akande (Brown) did manage to break the top-10, tying for 9th with 5-04.25. Harvard freshman Marlena Sabatino set a new season best in the pole vault at 12-00.50. This mark ranks her 2nd in the conference. Her teammate Lexie Schachne (Harvard) also cleared a career-best height of 11-06.5 to place 11th and now ranks 6th in the conference. Nikki Okwelogu (Harvard) had a huge win in the “invite” section of the shot put. Her throw of 55-0.75 is a new outdoor best, the new season leader in the conference, and new conference record. It also ranks 4th in the east region, and 8th in the nation. It might be a new meet record, if the invite section is eligible. In the discus, Brown frosh Josie Natrasevschi also participated in the “invite” section, placing 3rd with 157-06. In the same section, Okwelogu placed 6th with a new season best of 151-10, moving into 4th in the conference. Taylor DuPont (Harvard) was the runner-up in the hammer throw with 169-10, an improvement of over 3 feet on her PR, ranking her 3rd in Heps. Natrasevschi also threw a season best in the hammer, placing 6th with 164-06, 6th in Heps. In the javelin, current Heps leader Hannah Mayer (Harvard) threw 147-11 for 6th place. Two Harvard multi-event athletes competed in the heptathlon this weekend as well. Madison Hansen (Harvard) finished 5th overall with 5,070 points, while Allison Morrison (Harvard) was 7th with 4,972 points. That is a new season best for Morrison, who now ranks 2nd in the conference. She’s also 18th in the region and 50th in the nation. In the 100m dash, we saw Heps alumnus John Spooney (Michigan/Brown) take 4th overall in 10.41. That time was a season PR for him and is tied for 19th in the east region, and 37th in the nation. He also placed 5th in the 200m dash in 20.97, 25th in the region and T-48th in the nation. In the 200m dash, Ryan Kelly (Brown) placed 16th overall with a new wind-aided PR of 21.48 (2.2 wind). This is the new conference leading time. Kelly again finished first among Heps competitors in the 400m in 15th place with a time of 48.21, an outdoor PR that is 4th in the conference. Henry Tufnell (Brown) raced well in the 800m run, setting a new season best of 1:49.98 en route to 6th place that ranks him 4th in the Heps standings. 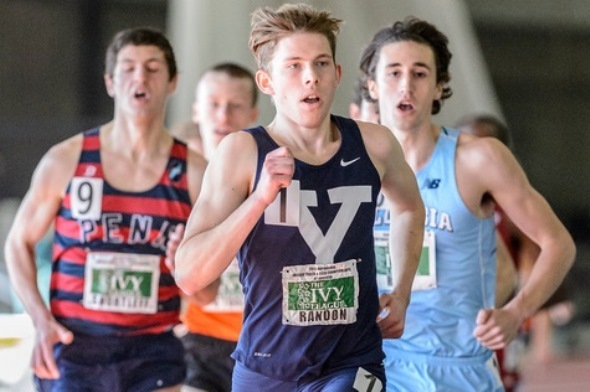 In the 1500m run, James Randon (Yale) had a breakthrough performance, placing 9th in a huge PR of 3:43.90, and moving into 3rd among Heps. Ned Willig (Brown) was close behind in 12th, finishing his first 1500 of the season in 3:45.41, 5th in Heps. Martin Martinez (Brown) also improved on his PR, finishing in a tight pack with Willig with 3:45.92 for 15th place, 7th in Heps. In the hurdles, Jarvis Harris (Harvard) placed well, ending up 5th in 14.27. The field events had some more Heps action for the men. In the high jump, Spencer Lemons (Harvard) set a new outdoor PR of 6-07.5 for 6th place, now tied for 6th in Heps. Brendan Sullivan (Yale) cleared a new career PR in the pole vault “invite” section of 16-08.75 – an improvement of 4 inches over his previous best, and his first time over 5 meters (he had cleared 5.00m once before). With this new mark, he moves into 2nd in the Heps standings. He’s tied for 26th in the region. In the open section of the pole vault, Matthew Miller (Harvard) tied for 8th with a height of 14-05.25. Josh Whitener (Harvard) made the top 5 in the hammer throw, placing 5th with a mark of 189-09. Matthew O’Hara (Brown) was 9th with 183-06. And in the multi-events, Mark Hill (Harvard) completed what seems to be his first-ever decathlon, scoring 6,008 points for 17th place and 3rd in the Heps standings. Cornell hosted nearby Buffalo, Niagara, and Canisius Colleges for the Upstate Challenge at the Kane Track and Field Complex on Saturday. There were many impressive showings, including a school record and a slew of top 10 Ivy League performances. The throwers were arguably the highlight of the meet. For the men, Stephen Mozia had a pair of top Ivy League winning performances in the shot put (66-02 1/2) and the discus throw (199-10). Not to be outdone, freshman Rudy Winkler extended his school record and top league performance in the hammer by a winning throw of 216-04. Freshman Mark Zavrl also had a winning throw of 196-0 in the javelin, number 3 in the league. Backing up these wins were the 2nd place finish of freshman Jacob Shaffer (158-08) and Winkler’s 3rd place (158-0) in the discus. In the hammer,Mozia’s 177-02 and Martin Murillo’s 175-10 placed them 2nd and 3rd , respectively. Vince Harnett also placed 2nd in the javelin with a throw of 174-11. On the women’s side, Felicia Reid had a winning javelin throw of 117-06 (9th in the league), while freshman Taylor Baker (151-09) and Renee McKee (148-10) placed 2nd and 3rd in the hammer. Camryn Goodman led a 3-4-5 finish in the discus with a 148-07 throw, followed by Baker (144-02) and freshman Taylor Drayton (118-01). Drayton also contributed a 4th place finish in the shot put with a 40-01 1/4 throw. The horizontal/vertical jumps showed that they are ready for the upcoming Heptagonal Championship with good performances, albeit many were wind-aided. Keith Rayburn tied the 2nd best jump this year with a winning pole vault of 16-08 3/4, followed by Steven Pawlak’s 3rd place jump of 14-11. Justin Love had the best long jump performance in the conference with a winning jump of 24-04 1/4 (with a +5.5m/s wind reading). Ryan Hynes came in 6th with a 23-01/2 jump (legal wind), followed by freshman Alex Rodriguez in 22-03 3/4 with a 7th place finish. Freshman Myles Lazarou led the high jump with a 6-08 1/4 jump, while Josef Mankovecky came in 3rd with a 6-04 1/4 performance. In the triple jump, Bobby Plummer led a 1-2-3 finish with a jump of 49-03/4 (2nd best in the conference), followed by Sean Waterton (46-11 1/2–5th in conference and wind-aided) and freshman Oseoba Airewele (46-01 1/4–wind-aided). Hillary Homes led the women jumpers with a 2nd place finish in the long jump of 18-11 3/4 (2nd in the conference), followed by a 5th place jump of 17-06 1/4 by freshman Claudia Dabrowski. Eve Bishop had a 2nd place finish in the pole vault of 12-05 1/2, while her teammate Alexis Bartholomew improved this outdoor season with a 3rd place vault of 11-11 3/4 (3rd best league jump). Freshman Kate Gulbrandsen and Stephanie Izard went 1-2 in the high jump with leaps of 5-02 1/4 and 5-01/4 respectively. Kyra Visnick (36-08 1/2) and Kristen Fawole (36-05 3/4) placed 2nd and 3rd in the triple jump also. The sprint/hurdle group was solid at this meet also. Freshman Brailin Paulino ran the 2nd fastest time in the conference under all conditions with a 10.65 2nd place finish in the 100 (+3.2 m/s wind reading), followed by a 5th place finish by Ryan Hynes in 10.88. Max Hairston ran an impressive winning time of 14.15 (+2.7 m/s wind) in the 110mH, followed by a 3rd place by Rachid Zidani (14.80) and 4th place by Wynn Curtis (14.92). Hairston followed it up with a win in the 400mH (54.54–9th best in the league). Zidana again followed with a 55.61 end place finish, while Jordan Sherwood completed the sweep in 55.83. Francisco Olloqui won the 400m in 49.97, while Larry Gibson garnered a 5th place finish in the 200m (22.55). Both the 4 X 100m and 4 X 400m placed 2nd in 42.06 and 3:19.61 respectively. Adrian Jones led the women with a winning run of 11.89 in the 100m (7th in the conference), along with being a member of the winning 4 X 100m relay team in 46.14. Freshman Ellen Shepherd turned in a 3rd place in the 100m with a time of 12.19. Jasmine Robinson placed 5th (14.38) and Hillary Holmes placed 6th (14.67) in the 100mH, which are the 6th and 10th performances in the Ivy League in all conditions, due to the +2.7 m/s wind reading. Freshman Taysia Radoslav ran a winning time of 56.08 in the 400m, leading three other teammates right behind her, Rochelle Forbes (59.58),freshman Kayleigh Carrillo (60.18) and Ally Knudson (60.67). Radoslave also turned in a 2nd place wind-aided effort in the 200m of 24.68. It seemed to be a low key meet for the distance squad. Despite that, there were many winning performances. For the men, Mark Tedder was the winner of the 1500m in a time of 3:53.22, while Phelan McCormack was 3rd in 3:59.99. Sebastian Roemer nabbed 2nd place in the 800m with a time of 1:56.75, followed by freshman Tim Boston’s 1:57.07 (3rd place) and Alex Clapacs’ 1:58.40 (4th place). The women had three 1st place finishes: Marianne Collard in the 800m (2:14.40), freshman Shannon Hugard in the 1500m (4:36.60) and freshman Mary-Alice Davidson in the 3000m (10:21.14). Others that place behind them included: 4th place by freshman Molly Novak in the 800m (2:21.29), 3rd place by freshman Leah Triller in the 1500m (4:39.98) and runner up in the 3000m (10:33.68) by freshman Jessica Elliott. Harvard sent a small contingent of athletes a couple of stops down the T’s Red Line to compete at MIT’s Sean Collier Invitational. No team scores were kept, but the following performances were highlights for Harvard. For the men — in the 1,500m, sophomore Jack Stevenson was just a minute off his personal best with a third-place finish in 4:00.69. In the 400m hurdles, sophomore Alex Kirby was seventh in a PR of 58.03. Kirby also won his flight in the javelin with a throw of 149’ 7”. For the women, lone competitor Lucia Alexander was fifth in the high jump with a jump of 5-02 ¼. Over the weekend, the Dartmouth College distance crew traveled to Walnut, California to compete in the annual Mt. SAC Relays, held at Hilmer Lodge Stadium on the San Antonio College campus. Senior, Claudia Pham, opened the meet with a win in the women’s 10,000 meter race besting the second-place finisher by more than 28 seconds. Her time of 34:40.55 smashed her previous personal best of 36:23.00, which she ran last year at the Heps Championships. In the 5,000 meter open, junior Reid Watson claimed the sixth place title with a 16:17.01, shaving nearly 15 seconds off of her personal best in the event set last year. Junior, Dana Giordano was 16th in the invitational 5,000 meters with a time of 15:54.05 (less than 1 second off her personal best) and junior Elizabeth Markowitz took eighth in the 1500 meters recording a 4:25.38. On the men’s side, junior Brian Materson finished fourth in the open 5,000 meters in 14:19.98. Junior Joe Chapin and sophomore Nathaniel Adams also competed in the men’s 5,000 meters running a 14:13.75 and 14:35.64 respectively. In the final event for Dartmouth, senior Curtis King crossed the finish line in 14:07.26 in the men’s 5,000 to finish 11th in the competition. On Saturday, Yale hosted the Mark Young Invitational, where they competed against a number of New England area schools including conference rival Brown. The meet was held under windy conditions, so many of the sprints and jumps performances had wind assistance. Brown had a great meet, as the Bears won a total of 4 events. Clare Peabody led a 1-3-4 finish in the women’s 1500m. Peabody’s winning time was 4:34.35, while Lydia Davenport (4:37.19) and Abigail Jones (4:39.56) both broke 4:40 in the event. Victoria O’Neil earned a comfortable win in the women’s 5,000m run, winning in 17:53.09 and 25 seconds ahead of the next finisher. Christian Bermal claimed the men’s 800m title in 1:54.31 while Mark Buda won the javelin throw with a new season’s best toss of 194-08. Aubryn Samaroo finished in second in the women’s high jump with a best clearance of 5-03. Courtland Clavette earned two runner-up finishes in the throws – 55-11 ¼ in the shot put and 176-08 in the discus (note – in the discus, he finished behind Brown alum Bryan Powlen, 188-11). Aaron Comery finished 3rd in the shot put with a new season’s best of 53-09 1/4. Freshman Oluwatosin Oyewole ran a new season’s best in the 200m (a wind-aided 21.76) to finish 5th overall and sit 5th in the conference standings. Peter Rhodes was busy as he competed in the pole vault (13-09 ¼), long jump (22-05 ¾), and shot put (38-05 ½). Karleh Wilson was the only Yale winner at the meet, as she won the discus throw with a new season’s best of 142-11 1/4. Wilson also finished 4th in the hammer (165-03) and 2nd in the shot put (46-09). Mackenzie Mathews was one of two athletes to run sub-15 in the 100m hurdles, as she ran 14.82 into a headwind to finish 2nd overall. In the men’s hurdles, freshman Paedyn Gomes finished 4th overall in 14.79. Yale’s Emily Cable battled Brown’s Audrea Holt in both the 100m and 200m events. In the shorter event, Holt finished in a faster time than Cable (11.98w to 12.02w) as they raced in different heats and finished 3rd and 4th overall. They went head-to-head in the 200m, where Cable turned the tables and held off Holt by 0.04 seconds, 24.23w to 24.27w, to finish 2nd and 3rd, respectively. In the high jump, the determination of second and third came down to misses between Brown’s Aubryn Samaroo and Yale’s Megan Toon as both cleared 5-03. In the end, Samaroo had fewer misses and was given the runner up, while Toon was in a three-way tie for 3rd with other athletes. Dartmouth switched up their weekend a bit and had the bulk of their teams participate at the UMass-Lowell George Davis Invitational. The meet was not scored, but the Big Green still dominated as the men won 13 events (12 individual and 4×100) and women won 9 events (8 individual and the 4×400). Brett Buskey was a part of 3 victories at the meet, as he won the 100m (10.72), 200m (21.82), and a member of the winning 4×100 relay (42.16). The 200m time is a new season’s best for Buskey as he led Lloyd May (22.46) and Guy Green (22.39) to a Big Green 1-2-3 finish. Freshman Marissa Evans and Jennifer Meech both won an individual event (400m hurdles for Evans, 400m for Meech) and were members of the winning 4×400 relay (4:08.79). Dartmouth also had a total of 9 top sweeps across both competitions. For the men, they earned top sweeps in the 800m (1-2-3-4, led by Kevin Stanko’s 1:55.02), 1500m (1-2-3, led by Julian Heniger in 3:55.37), 110 hurdles (1-2-4, led by Alex Frye in 14.66), discus (1-2-4, led by Dom Filiano in 152-06), and hammer (1-2-3, led by frosh Colin Minor in 192-09). For the women, the top event sweeps were in the 800m (1-2-3, led by Meghan Grela in 2:13.72), 400m hurdles (1-2-3, led by Evans in 1:01.40), pole vault (1-2-3-4, led by Stephanie Brown with 11-11 ¾), long jump (1-2-3, by Lauren Ready with 17-10 ¾), and javelin (1-2, led by Moriah Morton with 138-09). Other winners included Jacob Shippee (javelin, 207-02), Victor Ngei (triple jump, 44-04), Max Conculluela (pole vault, 15-11), Kyle Dotterer (two mile, 9:28.11), Zach Plante (400m, 49.20), Jazz Van Loon (triple jump, 34-09), Miranda Lawson (high jump, 5-01), Erin McDonnell (3000m, 10:13.66), Bridget O’Neill (1500m, 4:39.81), and Meech (400m, 55.43). This entry was posted on Monday, April 20th, 2015 at 8:31 pm. It is filed under Athletes, Spotlight. You can follow any responses to this entry through the RSS 2.0 feed.